In 1934, G. Warren Shufelt told the Los Angeles Times he had discovered the remnants of an ancient reptilian civilization under L.A. Even though Shufelt's story was a load of bullpucky, he left this nifty map as his legacy. 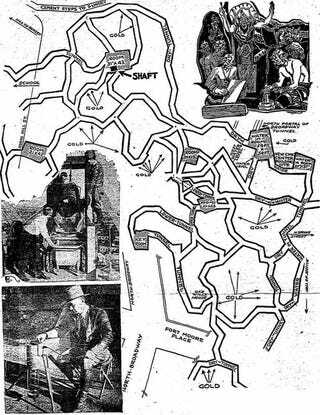 On January 29, 1934, Jean Bosquet of the L.A. Times reported that Shufelt, a geological engineer, had discovered a secret lizard city far underground using Native American lore and "radio X-ray." Shufelt's city turned out to be rather uncreatively lizard-shaped. According to the legend as imparted to Shufelt by Macklin, the radio X-ray has revealed the location of one of three lost cities on the Pacific Coast, the local one having been dug by the Lizzard People after the "great catastrophe" which occurred about 5000 years ago. This legendary catastrophe was in the form of a huge tongue of fire which "came out of the Southwest, destroying all life in its path," the path being "several hundred miles wide." The city underground was dug as a means of escaping future fires. The lost city, dug with powerful chemicals by the Lizard People instead of pick and shovel, was drained into the ocean, where its tunnels began, according to the legend. The tide passing daily in and out of the lower tunnel portals and forcing air into the upper tunnels, provided ventilation and "cleansed and sanitized the lower tunnels," the legend states. Large rooms in the domes of the hills above the city of labyrinths housed 1000 families "in the manner of tall buildings" and imperishable food supplies of the herb variety were stored in the catacombs to provide sustenance for the lizard folk for great lengths of time as the next fire swept over the earth. Shufelt's tale is a predecessor to the reptilian urban legends that currently run rampant on the internet and, presumably, the script to the Super Mario Bros. movie.